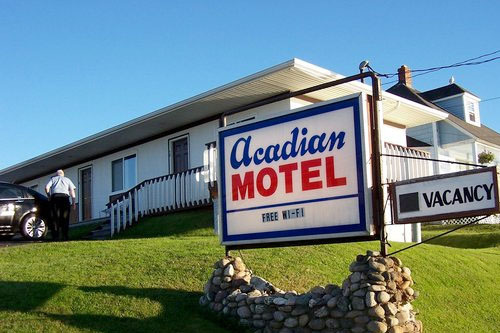 The Acadian Motel is an ideal location to relax and soak up the hospitality of Chéticamp on beautiful Cape Breton Island. A short jaunt brings you to the heart of the thriving downtown sector of Chéticamp and provides a variety of activities for everyone to enjoy – boutiques, unique craft shops, historic sites, whale watching tours, golfing at Le Portage Golf Club, hiking trails, and beaches. While staying with us, enjoy a day trip through the Cape Breton Highlands National Park and the lengedary Cabot Trail with panoramic views of canyons, highlands and seacoasts, golf, beaches, look-offs and interpretive programs. Come and be pampered by our staff and experience the uniqueness that is Chéticamp. Our accommodations include 15 units (two double beds in each, one unit with three double beds) with 4-piece baths, cable television, Wi-Fi, a fridge and microwave. Free coffee is available. We are a proud member of the Innkeepers Guild of Nova Scotia. Cancellation policy: Must cancel 24 hours prior to the day of arrival.